Clear negative energy with this ethically harvested hand made floral palo santo smudge incense bundle. Also makes a beautiful altar decoration. Made with wild Ecuadorian and Peruvian palo santo (holy wood) sticks that have been harvested only from fallen branches that have been dead for at least 4 years, as is traditional. I bundle California white sage leaves, and seasonal wildflowers with the palo santo for a beautiful and fragrant smudge wand, or decoration. 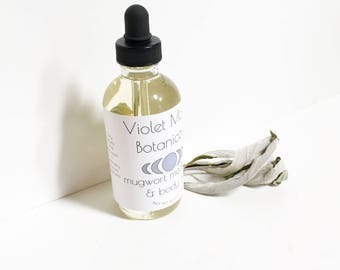 This smudge bundle is perfect to cleanse and combat negative energy, or as a pleasant smelling incense. 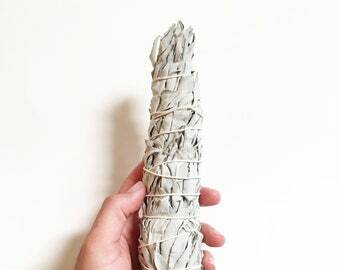 Many sage smudges are made with illegally or un-sustainably harvested white sage. 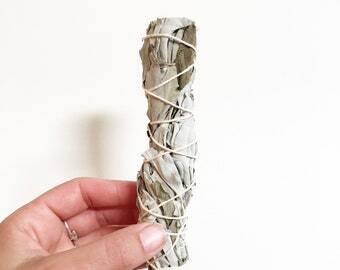 These palo santo, sage and flower bundles are made with white sage harvested with care from my garden. Palo santo and smudge sticks have been used for centuries in rituals to purify, cleanse, and dispel negative energy. They have been shown to clear the air of bacteria, as well as release negative ions, which may help promote a positive mood. 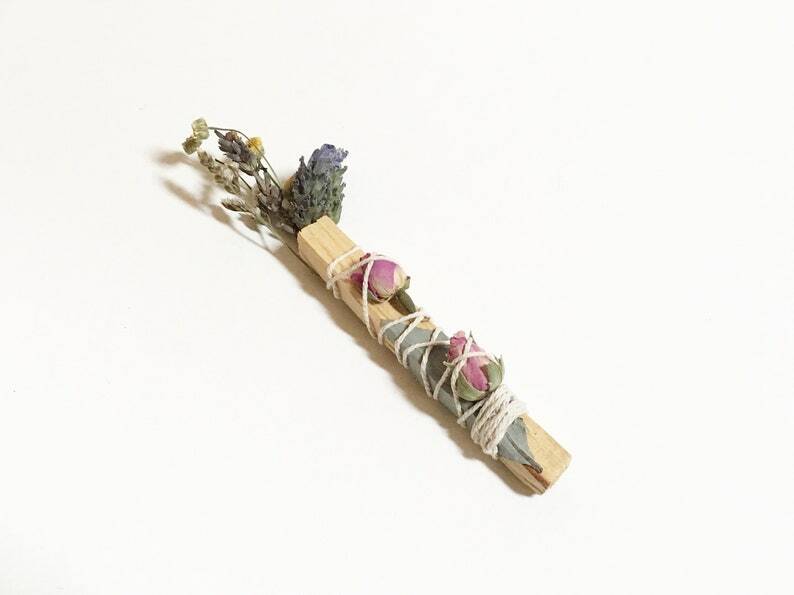 Each palo santo stick is bundled with hand picked California white sage, and flowers from sunny Southern California. Straight from my organically grown garden, I harvest and dry fresh California herbs and wildflowers by hand. I also include wild harvested herbs and flowers whenever they are in season. All ingredients are sustainably harvested, picked at their peak state and preserved for your enjoyment. The palo santo used in these sticks is from a source that harvests wild Ecuadorian and Peruvian palo santo only from dead branches that have been on the ground for at least four years, ethically and sustainably harvested. This listing is for ONE 4 inch long, 1/2 inch wide palo santo stick that has been bundled with California white sage, and seasonal flowers including mini pink roses, limonium, and lavender flowers wrapped in white cotton thread. Total length including the herbs and palo stanto stick is about 6 inches. To use: Open windows to allow excess smoke and negative energy to escape. If desired remove the sage and flowers to use as decor or burn separately, or keep attached and light them. Gently blow out flames, letting the material continue to smolder. At the same time carefully light the palo santo stick and let burn for 30 seconds to 1 minute, then blow out the flames. Use the smoke to cleanse the air in your desired space, or as a wonderful incense. I recommend using with a heat proof dish or abalone shell to catch ashes. When ready, extinguish in a bowl of sand or water. Ashes are traditionally disposed of by respectfully returning to the earth. Please always make sure ashes are completely extinguished before burying or leaving on the earth. Palo santo sticks are very long lasting and may be re-lit as desired. *For external use only. Herbs are intended for incense purposes only. *Never leave burning herbs or palo santo alone or unattended. Always burn stick using a heat resistant dish, or abalone shell. Keep away from anything flammable, keep away from children and pets and always make sure to have your windows open for excess smoke and negativity to escape. *Please note that designs may slightly vary as each bundle is completely handcrafted by me using seasonal flowers. 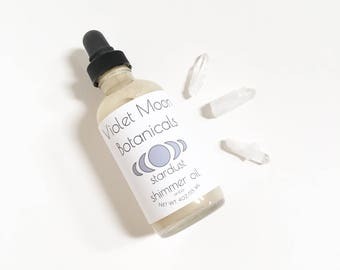 Check out my Etsy home page for more energy cleansing smudge sticks, boho, gypsy, and witchy decor and creations, as well as natural and vegan beauty and bath products! Smells amazing and looks so pretty! Also loved the sample of the oatmeal soap. Cedar Incense Cones - cedar scent hand rolled natural incense for holiday, yoga, ritual meditation, and smudge use.